As soon as one holiday ends, it is time to start planning for the next one. There are several eating areas in our house all created with neutral palates to easily transition between seasons and holidays with any color palate. This way, I can change things up every season…or not! For this fall season, I wanted to create a Contemporary Fall or Thanksgiving Table Setting for my breakfast area. I think it important to acknowledge here that my table belonged to my very special grandmother, Mimi (who recently passed away at 103 years old!). It was purchased by my great-grandfather as a wedding gift to my great-grandmother in 1900. Mimi grew up eating on this table and it has circulated through my family through the years, so I am very honored to have it now. The simple white side chairs are from IKEA until I find what I want for this area. The white fabric may seem scary, but the covers come right off and are machine washable. The permanent neutral colors used in this area are mostly grey and white, so I opted for orange as the primary accent color. To add the pops of color, these awesome orange leaf placemats at Bed, Bath and Beyond for $1.99 each were perfect…a great bang for the buck!! 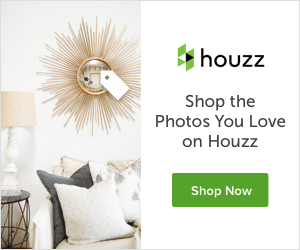 They are layered over my every day grey/silver square placemats. The grey and white striped napkins came from TJ Maxx and where very inexpensive and nice and casual! I have owned the napkin rings for a couple of years and they go with almost anything (purchased from Pier One). These adorable pumpkin soup bowls from Pottery Barn (and the orange pillows on my settee to coordinate with the table) complete the look. The bowls would also be great to serve one of your favorite fall/winter soup recipes!! Click here for a great Pumpkin Soup recipe! The candle holders in the middle of the table are a staple on my table. For this centerpiece, I simply added a variety of orange and silver pumpkins to complete the look. A great set of black wine glasses on hand from ZGallerie add to the contemporary look of the table setting. It absolutely gives the table a bit of a “Halloween” flair. Simply choose a pop of color that compliments your existing every day serving ware and you can put together a great table setting for very little money! With a neutral backdrop, you can simply add a few pops of color and totally change the look! For more beautiful fall and Thanksgiving table setting inspirations, follow my Pinterest Board, Fall and Thanksgiving Table Settings to see more creative ideas! 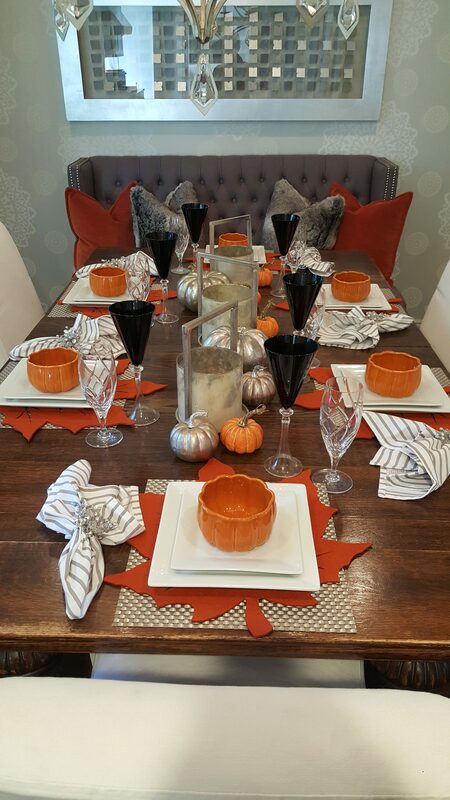 Thank you for stopping by today to learn more about my Contemporary Fall or Thanksgiving Table Setting! Hopefully, there are a few helpful hints here. Please consider subscribing to my blog so that you can receive instant and free email notifications of new posts. Have a great day!